Controllers in the series support a common core of features and differ only by I/O count and network connections. Configuration is via a 10/100 Mbps Ethernet connection. All models have a real-time clock and are powered from a 24 VAC/VDC power source. 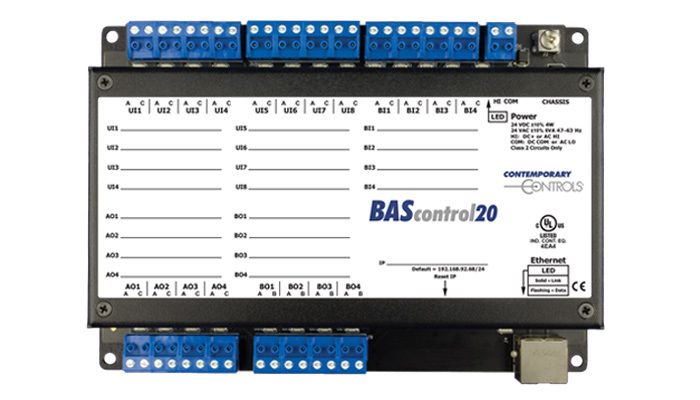 The BAScontrol20 is a 20-point BACnet/IP, Sedona-programmable unitary controller with direct connection to an Ethernet network. The unit complies with the B-ASC device profile having a convenient mix of 8 universal inputs, 4 binary inputs, 4 analog outputs and 4 relay (20R) or triac (20T) outputs. The controller is fully web-page configurable using a common web browser, and freely programmable using Niagara AX Workbench™ or Contemporary Controls' free Sedona Application Editor (SAE). Rugged metal design, low profile, and wide temperature operation make it suitable for indoor or outdoor use. 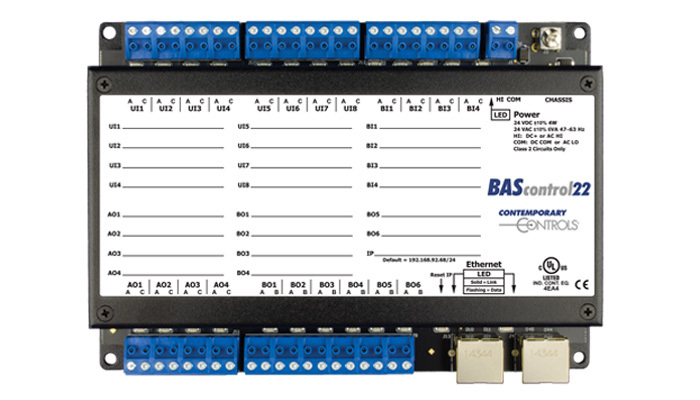 The BAScontrol22 is a 22-point BACnet/IP, Sedona-programmable unitary controller with a 2-port Ethernet switch for connection to an Ethernet network. The unit complies with the B-ASC device profile having a convenient mix of 8 universal inputs, 4 binary inputs, 4 analog outputs and 6 relay outputs (no triac model). The controller is fully web-page configurable using a common web browser, and freely programmable using Niagara AX Workbench™ or Contemporary Controls' free Sedona Application Editor (SAE). Rugged metal design, low profile, and wide temperature operation make it suitable for indoor or outdoor use. The BAScontrol22C is a BACnet/IP server and also provides BACnet/IP client capability which allows the user to read and/or write points served up by devices on the BACnet internetwork. 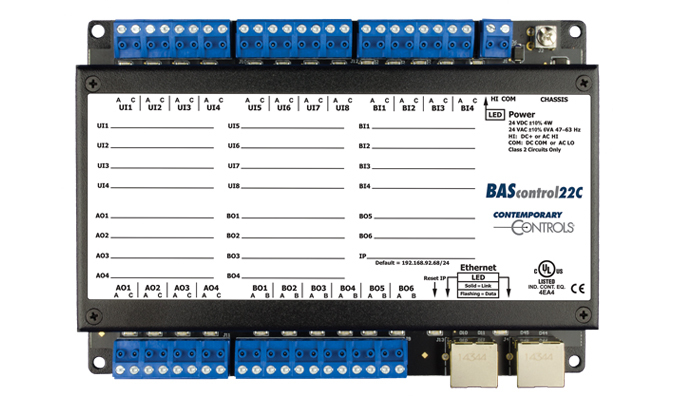 The BAScontrol22C is a 22-point unitary controller which supports BACnet/IP and Sedona using a 2-port Ethernet switch connection. The controller complies with the B-ASC device profile having a convenient mix of 8 universal inputs, 4 binary inputs, 4 analog outputs and 6 relay outputs. Unique to the unit are 48 web components which link Sedona wire sheet readable/writeable data to web pages, and 24 virtual points which link Sedona wire sheet readable/writeable data to a BACnet client.